Haemodialysis is an effective dialysis treatment for removing excess water and waste products from the body. However, it is rarely the first choice of treatment in young babies with kidney failure, as it is technically much more difficult than other types of dialysis. Haemodialysis can become a necessary treatment for children with kidney failure – when the kidneys stop working properly. Using a special machine with an ‘artificial kidney’, haemodialysis removes extra water and waste products from the blood. This partly replaces the work of healthy kidneys. Haemodialysis usually takes place three or more times a week at your child’s paediatric nephrology unit – a specialised unit at the hospital that treats babies, children and young people with kidney conditions. The hospital can arrange transport so your child can travel to and from the hospital. Some families are able to do haemodialysis at home – and get equipment and training from the hospital. A team of healthcare professionals will do regular assessments – the amount of time on dialysis and some other details will be adjusted especially for your child’s needs. They will show you how to help manage your child’s health while on dialysis, and will look out for any possible complications. Haemodialysis is often shortened to HD. Another type of ‘haemodialysis’ performed in the hospital is ‘haemodiafiltration’, shortened to HDF. Another type of dialysis is peritoneal dialysis. The haemodialysis machine will need to pump blood out of and back into your child’s body. Your child will need a procedure to allow access to the bloodstream. There are two main options – creating a fistula and inserting a ‘line’. An arteriovenous fistula (usually shortened to fistula) can be created. This joins two types of blood vessels to make one large, stronger blood vessel – usually at the wrist or elbow. For regular dialysis sessions, the needle(s) are inserted into the fistula. A fistula needs to be made about 8 weeks before dialysis starts, to allow time for it to develop and get strong enough. For many children who are on dialysis long term, a fistula is the best option because there is much less risk of infection or blockage. Occasionally, a fistula fails to develop, or there is bleeding or other complications, and some children need to come back for a new procedure. With a good functioning fistula there is a ‘buzzing’ feeling in the area around the fistula, and your child will be shown how to take care of it. A central venous line is a soft, long, thin tube (catheter) that is placed into one of the large blood vessels in your child’s body. This is usually in the neck or chest, or occasionally the groin. It is often called a ‘line’. A temporary line can be placed for children who will need haemodialysis quickly or for a short time. For long-term use, a permanent line is placed by surgery. For each dialysis session, tubes are connected to the end(s) of the catheter. In haemodialysis, a machine with an ‘artificial kidney’ called the dialyser cleans the blood as it passes through the machine. Blood is pumped out of the body, through tubes, and passes through the artificial kidney before being returned to the body. Each dialysis session usually lasts 3–4 hours and is normally done during the day, although if done at home, overnight is another option. Most children have sessions three times a week, though they may need it more often. Although children are connected to the machine, they can read, do school work, play with toys or sleep. It may be possible – or sometimes necessary – to change the type of dialysis for your child. This may depend on your child’s health and complications of dialysis, how he or she is responding to dialysis, or your family’s situation. Speak with your child’s healthcare team for more information. Haemodialysis is a crucial, life-saving treatment for children in kidney failure. It removes toxins and excess water from their body which, if left untreated could reach dangerous levels and become life threatening. The vast majority of children with kidney failure are able to have this treatment. However it has side-effects, impacts your child’s and family’s lifestyle and carries risks. Your healthcare team will speak to you about these risks, and what to look out for. They include the following. Blood clots (thrombosis) – when the blood clumps together. If this happens in a line, fistula or graft, it may stop working. Narrowing of blood vessels (stenosis) – this usually happens slowly and your child’s dialysis team can look for early warning signs. Side-effects – including feeling tired during or after the dialysis session, muscle cramps or low blood pressure (hypotension), which may be sudden. There are some other risks, depending on whether your child has a fistula or a line. Haemodialysis can be a difficult and stressful experience for your child and the whole family, including other children. You and your child will learn more over time about how to help live with dialysis. Your child’s healthcare team is there to help you. They can provide support with your child’s education, accessing financial benefits and planning holidays around dialysis. There may also be help available from a team social worker and/or psychologist. Speaking with other families of children on dialysis can also be a huge support. A central venous line (or ‘line’) is a long, thin tube (catheter) that is placed into one of the large blood vessels in the body. This is usually in the neck or chest, or occasionally the groin. Part of the catheter is inside the body, and part outside. The part of the body where the catheter comes out is called the exit site. There are one or two ports, or caps, at the ends of the catheter, which connect to tubes for each dialysis session. A line can be inserted shortly before the first dialysis session starts. A temporary line is used for short-term dialysis. The line is inserted by a surgeon/anaesthetist or nephrologist. The catheter is inserted into a vein, and exits in the same site. A permanent line is used for long-term dialysis. The line is usually inserted by a surgeon or anaesthetist. The catheter is inserted in the vein and then tunnelled under the skin to exit at a different site. For example, if the catheter is inserted in the neck, it exits on the front of the chest. This means that the catheter cannot be seen when your child wears a shirt or blouse. It stays secure with a cuff, which sits under the skin. This type of catheter is sometimes called a tunnelled cuffed catheter. A line can be inserted shortly before haemodialysis needs to start. The procedure takes place at your child’s paediatric renal unit, a specialised unit for babies, children and young people with kidney conditions, which may be in a different hospital. The procedure usually takes 1–2 hours, though your child will probably stay in the hospital for at least one night to recover. You can bring a change of clothes and some toys and books. The general anaesthetic will be given as an injection or breathed in. When your child is asleep, the surgeon will make a small cut in the area where your child’s catheter will be inserted – this is normally in the chest or neck – and carefully place the catheter into a blood vessel. Your child will go back to the ward, where he or she will be monitored by a healthcare team – this may be for one or two days, or longer. He or she will have a dressing over the cut. The catheter will be taped to his or her skin. Your child may feel some effects from the anaesthesia, but these do not usually last long. They include feeling sick and being sick (vomiting), headache, sore throat, or feeling dizzy or lightheaded. All surgery has some risks, but these are very rare. Occasionally, children bleed from the cut. Some need to go back to the hospital, and/or will need to take antibiotic medicines to treat an infection. Very occasionally, the surgery causes a puncture wound in a lung. This may cause problems breathing (pneumothorax), and may require surgery to treat. The most common complication is infection, caused by germs entering the body. Infections are more likely in a line than in a fistula. If your child has a fever (temperature above 38°C), this may be a sign of infection – contact your unit straight away. Most infections can be treated with antibiotic medicines, which kill germs. Sometimes, this can be septicaemia (infection in the blood), which is more serious. In these cases, the line may need to be removed. A new line can normally be inserted after a few days – after the infection has cleared – and haemodialysis can start again. You and your child will be shown how to keep the exit site clean to reduce the risk of infection, and to make sure the catheter stays taped to his or her body so it does not get dislodged or caught in clothing. Make sure that you, your child or anyone else does not remove or touch the ends (the ports or caps) of the catheter. If this happens contact your renal unit. Each dialysis session usually lasts 3–4 hours and is normally done during the day. Most children have sessions three times a week, though they may need it more often. . Although children are connected to the machine, they can read, do school work, play with toys or sleep. 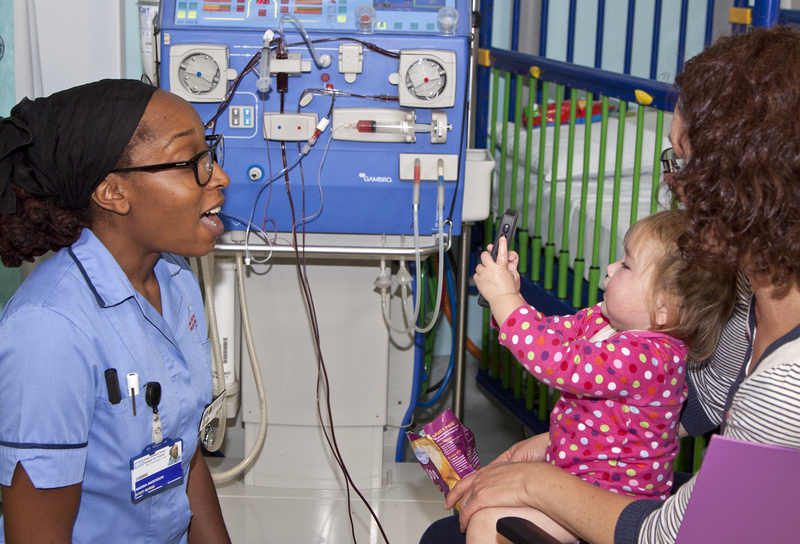 Most of the time, haemodialysis takes place in a special area in the paediatric renal unit at hospital (hospital HD). Your unit can offer transport, such as a taxi or bus service, so your child can travel to and from the hospital. Some children have haemodialysis in their home (home HD). In the UK there are now two types of HD machines. The one that is most commonly available is about the size of a large chest of drawers and heavy. These machines will require some modifications to your home in order to work safely and effectively. There is also a smaller, mobile machine that does not require any home modifications but you will require more space at home to store all the supplies. Both types of HD service may not be available at your unit, but if you ask your consultant, arrangements can be made for you to learn at another unit. In order to do undertake HD at home, some practical issues will need to be thought about. Your home will need to be able to fit and accommodate the equipment. The machines and equipment, including the supplies of concentrate and water, need to be carefully stored away from children and pets. Your unit will assess your child. Some children who are very young or small may only be suitable for hospital HD. If you decide to use haemodialysis at home, you will receive lots of training and support from your unit. For each dialysis session your child is connected to the haemodialysis machine. Your child will need a quick assessment before each session. The machine is then programmed especially for your child. temperature – to make sure your child is not too hot or cold. Your child is connected to the machine. If he or she has a fistula, one or two needles are inserted into it – special gel or cream can be used to help your child stop feeling any pain. The needle(s) are placed in the fistula each dialysis session. If your child has a line, the tubes will be connected to the port(s) at the end of the catheter. The machine pumps blood out of the body through the tube. The blood passes into an artificial kidney, which is called a dialyser. This sits outside the machine. The dialyser has a membrane that contains millions of small holes that acts as a sieve or filter – this works a bit like the filters in our kidneys (the glomeruli). The dialyser is continuously bathed with a special fluid called dialysate. As blood passes through the dialyser, waste products and salts move across the dialyser membrane into the dialysate fluid and are safely removed from the body. Excess water also filters out of the blood through the membrane and is removed from the body. This is called ultrafiltration. The cleaned blood is then pumped back out of the dialyser through another tube and back into the body. Blood is pumped out of and into the body quickly – only a small amount of blood is outside the body at any time. A nurse – or you if at home – will measure your child’s blood pressure throughout the session. Although your child is connected to the machine, he or she can read books, play games, do homework or sleep. A newer type of ‘haemodialysis’ called haemodiafiltration (HDF) is performed in some children’s kidney units. It uses a similar machine but works differently to clean out the blood and remove more toxins from it. Your child may receive some of his or her medicines at the same time as haemodialysis. These are added to the circuit. EPO (erythropoietin) or darbepoietin – many children need to take this hormone as a medicine, as their kidneys are less able to make the hormone, which also helps make red blood cells. After the session, your child is disconnected from the machine. The nurse – or you, if at home – will take your child’s blood pressure and temperature, and weigh him or her to check that the right amount of fluid has been removed. This is the end of the information on haemodialysis. Further topics about kidney conditions, tests and treatments are available on the infoKID website at www.infoKID.org.uk.